Addressing his skills for insider trading, Judge Jed S. Rakoff sentenced former Goldman Sachs director Rajat Gupta, 63 two years in prison. Now Rajat Gupta will trade in equities from actual 'inside' experience. "We appreciate inside trading skills of Rajat Gupta and expect he will do it for us, for the great US economy a boost the stock markets. Therefore, we decided to send him inside jail so that he will do more and more inside trading for us at least for next 2 years," said Judge Rakoff. US government and jail authorities will provide Rajat Gupta a LCD computer with CPU and speakers to trade seamlessly in the stock markets. While Rajat Gupta's demand for Bloomberg was under consideration, he will get one of the best high tech terminals to trade in the stocks. "I believe Rajat will put all his experience in the stock markets and would do insider trading in more effortless manner from jail," said US President Barack Obama. He said "With Raj Rajratnam (11 years in jail), I am hopeful that Rajat Gupta will make all the efforts to boost US' capital markets." 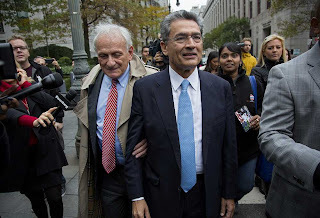 Talking on his new duty, Rajat Gupta said "I am thankful to great country the USA for providing me such a great honour to trade from jail so that I can live the name insider trading, that is trading from jail."